Zhang Zhao draws X+1 cards during his drawing phase. Where X is half the number of living players, rounded down. Zhang Zhao cannot be the target of Starvation or Break. 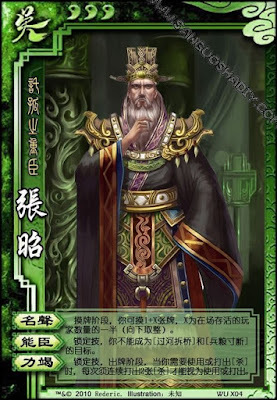 During his turn, whenever Zhang Zhao uses an attack, he must use an additional one as well. Zhang Zhao's "Reputation" replaces his normal drawing phase. He does not draw two additional cards. Outside of his turn, Zhang Zhao can use attacks normally.